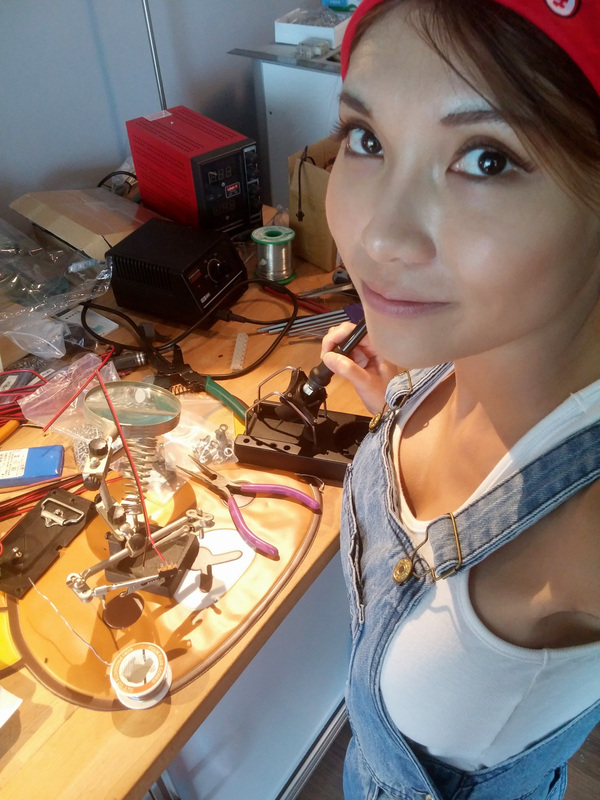 SexyCyborg is an electronics geek out of the ordinary. Recently she posted some pictures of her DIY Underlit LED (Hikaru) Skirt. And that caught my attention. Not because I’m a guy, and that’s a tiny skirt. But because I love to see people being different than the norm. OYVIND: How did you learn to build things with electronics? 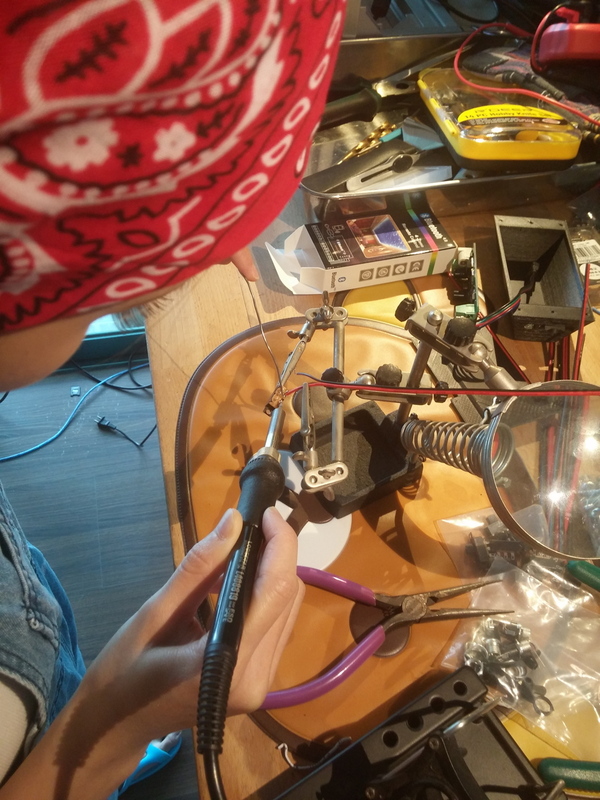 SexyCyborg: I had seen Arduino being used at local Makerspaces and of course read about them. I’m more of a software person than hardware, but I felt that being able to interact with hardware was important. I like to do tutorials, that way I don’t feel rushed or embarrassed if I have a little trouble or need to go slowly. I had met the Seeedstudio guys at their Maker Faire booth (they are a local Shenzhen company). They have a starter kit (ARDX) that I set out in front of the TV and slowly worked my way through over a few nights. Adafruit carries it also I think. A lot of it makes no sense when you do it (shift registers) but when you read other tutorials or see projects a light goes off “hey…I know what that is…”. Or you see a thermostat on the wall and now you have a pretty good idea how one works. I would say, that kit or its equivalent is basic knowledge that everyone should have. OYVIND: What project are you the most proud of? SexyCyborg: Not the skirt! Haha. It was just a project to see what was the simplest possible way to add remotely controlled LEDs to clothing. Something that would allow the sewing machine and hot glue gun ladies to use simple electronics in their projects. If it does that and the project is forked, then I will be proud of it. Since this is my only hardwired project so far, I have to see what I will end up being proud of. OYVIND: What kind of reactions do you get when you wear the LED skirt? SexyCyborg: Online people can be a bit rude but in the real world people love it. Lots of smiles, questions and pictures. It’s meant to be fun and little silly. It’s a great conversation starter and little girls love it of course, so it gives me a chance to talk to them about tech. OYVIND: What are your passions? SexyCyborg: Open Source. OS software frameworks are how I earn a living. People donating their time and expertise online, it is where and how I learned. That debt will never be cleared for me. Trans humanism and personal augmentation. The more robot parts I can get, the better. Obviously, being a very small person I find the idea of powered arms or legs very appealing. I was an early Google Glass beta tester and thought the hardware was great but crippled by Google software. I’d love to see that implemented in a more open way. Cyberpunk – Blade Runner is my favorite movie. I’m less interested in the fiction than the aesthetic. Seeing design and fashion start to take on those visual elements. Baking – I did not learn how until I was 18. Chinese don’t own ovens or follow recipes. Learning to follow a recipe in English was the skill that let me follow every other kind of tutorial online. If you want your child to learn technical skills but they are uninterested, baking is a great substitute because you have to be methodical and follow instructions. Once they have that skill they can follow any other kind of tutorial and teach themselves anything. OYVIND: What advice do you have for people who want to start building projects with electronics? SexyCyborg: At least for women, I think there are some of us who learn well in a group environment and some who don’t. Like exercise – some of us feel awkward in a gym with a lot of other people. Makerspaces are great if that’s how you like to learn but it’s also perfectly possible to teach yourself at home at your own pace. While it’s best to understand underlying principles, you can build great stuff even if you don’t. We all learn in school what the yeast does to make the dough rise – but really, we can make perfectly good buns and breads just following the right steps. It’s great to know low-level theory but if that’s not your thing it does not mean you can’t be a Maker. Thanks a lot to SexyCyborg for doing this interview! And if you know someone who’s out of the ordinary and is building electronics, let me know by commenting below! What people does to get some popularity on the net….